When using the web interface, there is a favorite tags section where you can select a list of tags that you view most frequently. This has become a cornerstone of my normal workflow on stack overflow, but it doesn't look like this is possible in the Android app. There should be a mechanism by which you can add some favorite tags to the nav bar. Clicking these tags will take you to a list of similarly tagged questions. Perhaps also the feed should include a section for each favorite tag. These would be presented on their own, much like how "hot new questions" and "new unanswered questions" appear in the feed. 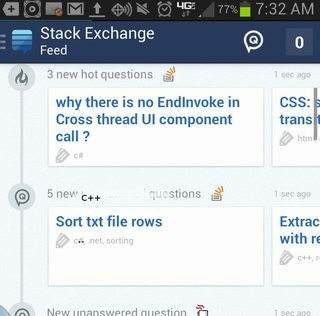 Browse other questions tagged feature-request android-app android-app-feed .